In resting healthy individuals the heart rate normally fluctuates between 60-80 beats per minute with a regular rhythm. A number of diseases can disrupt this rhythm, with potentially serious consequences such as sudden death or brain stroke, and thus require treatment with antiarrhythmic drugs. Amiodarone is one of the most commonly prescribed antiarrhythmics in the US due to its great efficacy and relative safety. Unfortunately, the thyroid gland can be affected by amiodarone in as many as 20% of users, with results ranging from minor alterations in thyroid function tests (due to interference with deiodinase activity) to overt hyper- or hypothyroidism. Affected patients should be seen by a thyroid specialist in order to determine whether thyroid-specific mediations are needed and/or amiodarone suspended. Thyroid hormones are iodine-containing molecules and thyroid cells are specially equipped to take up iodine from the bloodstream to use for thyroid hormone synthesis. Remarkably, amiodarone’s structure contains iodine and resembles that of thyroid hormone, greatly increasing the daily iodine intake in patients receiving this drug. In patients with pre-existing thyroid nodules or Graves’ disease (a form of hyperthyroidism), this increased iodine load can fuel an even greater production of thyroid hormone and thus result in hyperthyroidism. Another way through which amiodarone can cause hyperthyroidism is through its direct toxic effect on the thyroid gland, damaging the thyroid tissue with uncontrolled release of premade thyroid hormone. This elevates thyroid hormone levels in the circulation and causes transient symptoms of hyperthyroidism that usually resolve after weeks-to-months. At times, distinguishing between these two forms of amiodarone-induced hyperthyroidism can be challenging and it is best to enlist the support of a thyroid specialist. 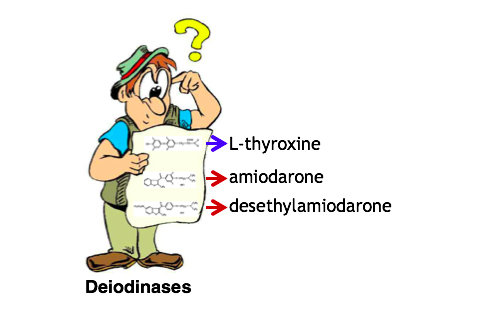 In contrast, excess iodine from amiodarone can also lead to hypothyroidism in patients that cannot auto-regulate the thyroid uptake of iodine (escape from the Wolff-Chaikoff mechanism). Under normal circumstances the work up for hypothyroidism is straightforward and the diagnosis is made by elevated serum TSH levels. However, patients on amiodarone can also exhibit elevated serum TSH that are not always associated with true clinical hypothyroidism. In fact, many such patients in the first few months after starting amiodarone have elevated serum TSH (in the 10-20mIU/L range) but associated with high serum levels of thyroid hormone (T4), which is not compatible with true hypothyroidism. 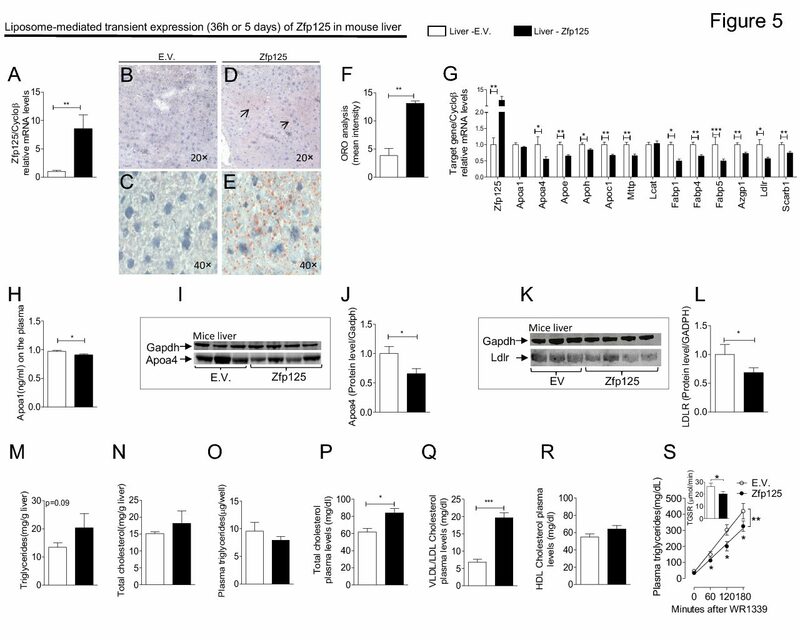 The coexistence of elevated serum TSH and T4 is in fact typical of mice with disruption of the type 2 deiodinase (D2) gene, the thyroid hormone activating enzyme critical for T4-mediated TSH regulation. This observation led investigators to hypothesize that amiodarone may inhibit D2. Amiodarone and its metabolite desethylamiodarone were found to inhibit D2 enzymatic activity in a dose-dependent manner, interfering with the T4 signal and softening the TSH feedback mechanism. Further studies indicated that amiodarone and its metabolite act as noncompetitive inhibitors of D2. These effects were observed in test tubes as well as in tissues of amiodarone-treated animals, including the pituitary gland and parts of the brain (hypothalamus) involved in TSH regulation. This inhibitory effect on D2 disrupts T4 signaling and releases the pituitary to secrete more TSH. Therefore, if the patient is on amiodarone, an elevated serum TSH by itself is not sufficient to initiate levothyroxine replacement therapy. Establishing a diagnosis of hypothyroidism requires the combined elevation in serum TSH with low or low-normal T4 values, or when the TSH elevation persists beyond about 6 months of amiodarone treatment. Many patients with amiodarone-induced thyroid dysfunction wonder if the drug should be discontinued. If the patient is exhibiting hypothyroidism probably not, because this can be successfully treated with thyroid hormone replacement therapy via daily tablets of levothyroxine. In cases of amiodarone-induced hyperthyroidism, discontinuation must be considered carefully by the cardiac and thyroid specialists because amiodarone is often used to control life-threatening arrhythmias. Also, the medication has a long half-life and thus discontinuation will not have an immediate effect on the thyroid. In addition, discontinuation of amiodarone may actually temporarily worsen hyperthyroidism because it also inhibits the other thyroid hormone activating deiodinase, D1, which plays a greater role in hyperthyroid patients. Therefore, patients with severe hyperthyroidism in whom discontinuation of amiodarone is deemed necessary must have their hyperthyroidism adequately controlled with antithyroid medications before attempting to stop the drug. Amiodarone is an efficacious therapy for many cardiac arrhythmias but can induce hyper- or hypothyroidism via mechanisms including iodine loading or thyroid gland destruction. The diagnosis of hypothyroidism in such patients can be complicated by disruption of the mechanisms that control thyroid function due to inhibition of deiodinases. Clarification of the etiology of thyroid function perturbation is important as these side effects have different treatments. Cardiac and thyroid specialists should be involved in the decision to continue or discontinue amiodarone. Contributed by Elizabeth McAninch, M.D.